In my overtones singing courses, we work primarily on the amplification of acoustic perceptions… in fact, in order of importance, the first element needed to be able to sing overtones, is the ear: our brain, always concentrated on the logical, the mental, on communication, has forgotten how to listen! Harmonic sounds are certainly the first to be perceived inside the mother's uterus; this could be the reason why particular sound waves have an evocative effect on our subconscious and a regenerating effect on our cerebral cortex. They also have a meditative power: our personality quietens and becomes docile on hearing these sounds, which in some way reconnect us with an important moment in our life. Just think that until a few years ago, western man, when faced with shamans who used this technique to communicate with the higher powers, thought that it was a congenital defect of savage peoples… “inferior races”…or that it was a trick! Our poor technological European man, didn't realise what he was dealing with! It's incredibile to think that just speaking normally everyone emits harmonics… but few people hear them! Actually, from sound analysis, they prove stronger than the basic sound that our brain is used to perceiving. It is for this reason that my courses don't only teach the technique...it's no use knowing how to do something that only the people around us can hear, but that we are unable to hear: we aren't aware of what we are doing! Think of every sound in nature and every musical instrument that produces them… but we don't have the ears to hear them! One of the things that fascinates me about this way of singing pure sounds, is that to be able to do it, you need to be able to know how to go beyond appearances. Another thing is that recharging the cerebral cortex and easily putting myself into a meditative state of relaxed attentiveness, I can drive for hours, even at night, without attacks of drowsiness! Overtones Singing is a particular singing technique with which it is possible to emit two sounds simultaneously. Usually a continuous note is sung, which corresponds to the normal voice and can be heard by all, while at the same time consciously generating a higher flute-like sound, with which harmonic scales can be intentionally sung. 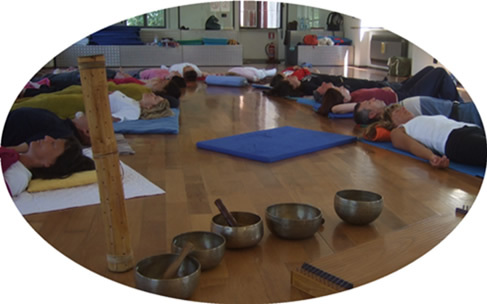 It is a fascinating, ancient technique, and is very efficient at leading us easily into meditative states, stimulating the brain, improving the quality of the singing voice and helping us to find health, harmony and balance. Overtones singing enchanted me from the start, and I have to say that several years passed from the moment in which i decided to learn to when I found someone who not only was willing to show how good he was, but also willing to pass on this conscious art to others. Perhaps it was also an internal question, and there is a time in which one becomes aware of these sacred sounds, when one's capacity for and mastery of overtones singing matures. Nevertheless I have met many teachers of overtones singing, and it is both curious and important to observe the different styles of teaching. ...this is one of the most efficient teachers of the technique. Thanks Trang Quang Hai :-). the Sound Being is present in him!